Comparing &quot;A Sound Of Thunder&quot; and &quot;The Monkeys Paw&quot;. 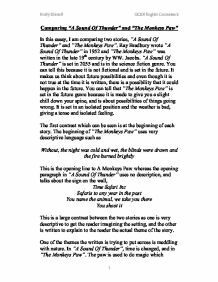 Comparing "A Sound Of Thunder" and "The Monkeys Paw" In this essay, I am comparing two stories, "A Sound Of Thunder" and "The Monkeys Paw". 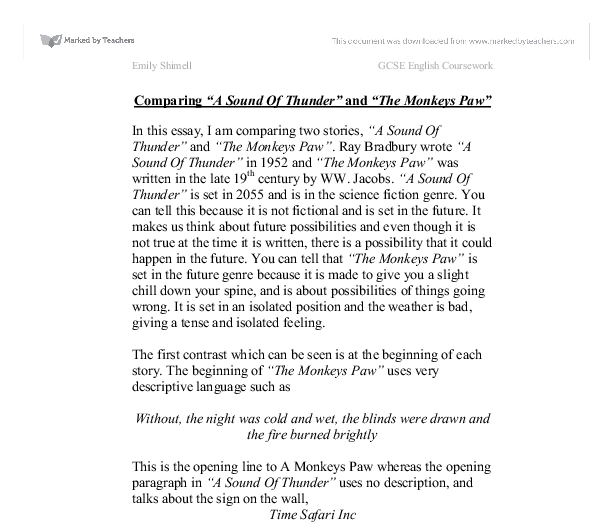 Ray Bradbury wrote "A Sound Of Thunder" in 1952 and "The Monkeys Paw" was written in the late 19th century by WW. Jacobs. "A Sound Of Thunder" is set in 2055 and is in the science fiction genre. You can tell this because it is not fictional and is set in the future. It makes us think about future possibilities and even though it is not true at the time it is written, there is a possibility that it could happen in the future. You can tell that "The Monkeys Paw" is set in the future genre because it is made to give you a slight chill down your spine, and is about possibilities of things going wrong. It is set in an isolated position and the weather is bad, giving a tense and isolated feeling. ...read more. In "A Sound Of Thunder", magic wasn't used to change nature, but an unnatural time machine. Even though both ways in which nature is changed are different, you can see that thgere is a link where they both change the future. Reading both stories, I found that some of the characters in each, both are dissatisfied with something in their lives, and have tried to improve the situation by trying to change the future for the good, but actually, greed has overcome them, them and has turned around on them, giving them unwanted consequences. I think that greed is a theme throughout both stories, as in "A Sound Of Thunder", Eckels says, Shooting my dinosaur As to say he owns it, or that he is superior to other hunters that may want to shoot the same species. Also, in "The Monkeys Paw", Herbert says Well wish for two hundred pounds then, that'll just do it Which shows he wants money without earning it. ...read more. In A Monkeys Paw, the family are in a traditional situation and where there is a death, it is a big loss in the story, as love seems to be a theme as well in this story, whereas, in "A Sound Of Thunder", the death of Eckels is not grieved, as he is not killed during the story, but at the end, so we can see that he may be not is loved by other characters in the book. My favourite story was A Monkeys Paw, as it was more built up and less obvious of what was going to happen. IT was in the horror genre, which is also a reason a lot of people would want to read this story, and keeps you hooked to the end. In "A Sound Of Thunder", it is very predictable of what will happen and it is set in the future, so cannot be pictured as easily for us. Emily Shimell GCSE English Coursework 1 ...read more. This student written piece of work is one of many that can be found in our GCSE Mildred Taylor section. The reason for prejudice being apparent is seen in the actions and thoughts of the past. Prejudice was seen in the way that the normal idea put forward when one was to cross Soldiers Bridge was that one vehicle would cross it at a time. The ride in the time machine home is tense. Know one knew that they were returning to a changed world. They questioned if Eccles had damaged anything that could economically destroy the human race. When they got back Travis became aware that all is not well. It was then that a group of whites organized themselves to form what they called the 'night men'. The night men slaughtered and punished black families, coming for them when they least expected it. The blacks were lynched, burnt alive, castrated, and were even blinded with hot pokers. Cassie thinks that this is Big Ma's fault and she still doesn't understand why Big Ma made her do it. Cassie thought she could just say no. The author is showing us that really there is no need for racism. His friends at school choose to completely ignore him. They shun him. By treating T.J. like this it reveals that the children know the difference from right and wrong. It also states that they know how to stand up for what they believe is right and for that they need to be admired. 7 years later thousands of slaves, led by Gabriel Prosser attacked Richmond. Their plan was betrayed, resulting in Prosser's and 35 other slaves' deaths. A similar betrayal took place in 1822 after 4 years of planning ending in 47 dead. Plantations still needed to be worked and so for the first time ever, black people were paid for their work, however, the wages were very low. Due to the fact that many liberated slaves had no other skills and no financial security, a large percentage returned to the plantations.